The ultra-right radicals from Kiev disrupted the service, which was made by ​​Rector of Holy Protection Church in the village Chervonaya Motovilovka Kiev region. The priest is Vladimir Navozenko. Later in the video are photos of priests killed. At 4:39 the priest prayed and he lost his life but a miracle occurred. On July 16 a procession with thousands of people went from the Stavropegial Monastery of the Protection in Khotkovo, a suburb of Moscow, where the relics of Sts. Cyril and Maria– the parents of St. Sergius – reside to the Annunciation field in Sergiev Posad. Therewith began the main Church-wide celebrations dedicated to the 700th anniversary of the birth of St. Sergius of Radonezh. The procession was preceded by a moleben [supplicatory service] in the St. Nicholas Cathedral in the Monastery of the Protection. 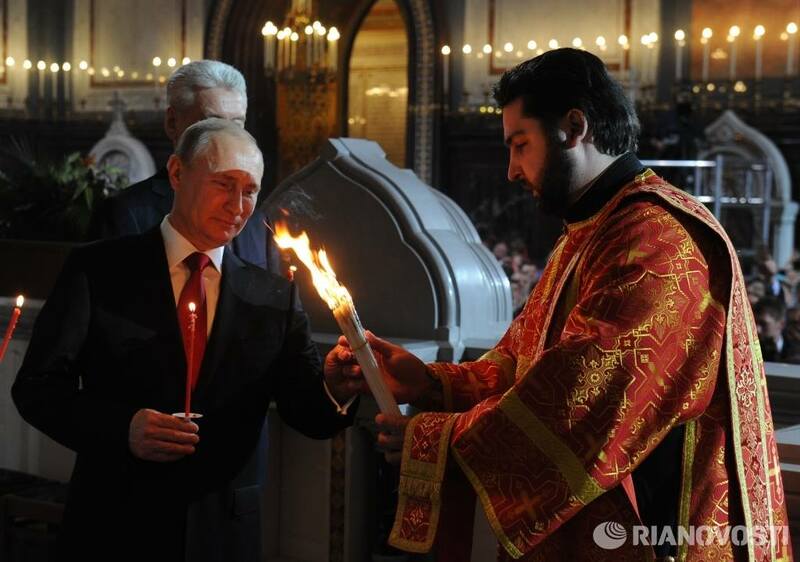 The divine services and procession were led by His Holiness, Patriarch Kirill of Moscow and All Russia. An area for celebrating the divine services has been set up near the tent city that has been deployed on the Annunciation field. The Primate of the Russian Church celebrated a moleben and read a prayer to St. Sergius of Radonezh. Your Eminences, Your Graces, Dear Vladykas! Revered Fathers, Brothers, and Sisters! Respected state officials! I would like to greet you all cordially following the seventeen-kilometer procession with which we have opened the jubilee celebrations on the holy land of Sergive Posad. For many today’s journey was something special, something they have never before experienced in life. This was not simply a march, not simply a walk by foot, not simply a trek – it was a procession, accompanied by unceasing prayer. I would like cordially to thank the choirs that continuously performed the great hymns of our Church, helping the mind to focus on prayer. And we believe that the prayer during this procession reaches and reached the Throne of God, and that St. Sergius, our abba, has heard it. But if you recall the distant past, it was common for people to walk to Sergiev Posad from the city of Moscow. We passed a small part of the path that our pious ancestors undertook, but we could feel great grace in our hearts. And what actually took place? Nothing in particular. People of the twenty-first century, living in relative or even complete comfort, decided, despite the heat, to walk. Someone thinking in rational terms might say: why was this necessary? It was necessary because it is in ascetic struggle [podvig] that involves not only the soul, but also the body, that our spiritual strength is tested. In response to this ascetic struggle, the Lord will hear our prayer and grant us what we ask. This is why we perform full prostrations, this is why we keep the fast, this is why we go on kilometers-long processions, and this is why we stand through fairly prolonged divine services. Because God accepts our little physical sacrifice, our small contribution, and gives us what we ask in return. Let us pray today and in all the days to come to St. Sergius, that he might raise our prayers to the Throne of the Almighty: for our people, for our entire historical Fatherland, for the Russian land, and for our Church, that he might preserve it in oneness and keep it from enemy forces. Let us also pray for those who perished yesterday in the Moscow Metro. In our capital today is a day of mourning. I know that today very many people are remembering those who perished. Let us also pray for the spiritual and physical health of those who survived this disaster. May the Lord grant them speedy heeling, and the Kingdom of Heaven for the deceased. May the Lord help us all to overcome the sorrows of life. And the more capable we are for ascetic struggles, including in the name of God, the stronger we will be, and the higher will be the summits that we can surmount ­ – both spiritual and earthly. May the Lord keep you by the prayers of the our Venerable and God-Bearing Father Sergius, the Abbot of Radonezh. Amen. Participating in the procession and moleben were hierarchs of the Russian Orthodox Church, members of the working group under the President of the Russian Federation for preparing the celebrations for the 700th anniversary of the birth of St. Sergius, the organizing committee of the Russian Orthodox Church for the celebration of the 700th anniversary of St. Sergius’ birth, and tens of thousands of pilgrims. 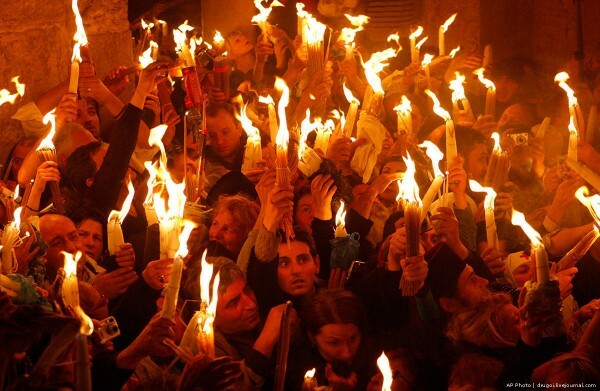 “A group of pilgrims will deliver late on Saturday the Holy Fire from Jerusalem to the central Russian cathedral. A special flight is expected to land in Moscow, where the Holy Fire will be traditionally greeted by hundreds of Russian believers. Rebuilding 18th century St. Basil the Great with help of Russian commander Alexander Suvorov. The village Kistysh, Vladimir region, for the third consecutive year, enjoys a national fundraising. The grace of God rises the church from the ruins. Yes, its all in Russian but seeing is believing. Communists were defeated and Christ is victorious in Russia. Bells ringing celebrating Christmas day in Russia. Churches are filled by thousands who stand to hear Christ’s word and receive holy communion. Afterwards, a procession takes place as shown in this video. The sacred icons are in front with the priest behind them. Behind the church (not shown) the priest prays and sprinkles everyone with holy water. Then they return inside the church. They did the same thing the night before at the midnight vigil praising and thanking God. 98% of these people have no car and either walk to church or pay to take the bus. I cannot imagine Americans doing this especially coming to church Christmas eve and Christmas day and filling up the churches to give praise to God. “Christmas”, sung by Natalia Kupriyanova and Elena Malova.